OPEN LETTER TO MY YOUNGER SELF. You'll be fine. Let go. In November of 2017, I received a text that would fulfill a couple of my dreams. Curator, Neysa Page-Lieberman asked “Would I like to go to Morocco to paint a mural?” For a moment it didn’t feel real. For years I’ve flipped through magazines and the internet fascinated with artists that traveled the world to paint multi-story murals in countries I’d never been. It was something I often hoped to do. I started my public art career about 8 years ago, while running a full time art business which consisted of gallery exhibits, corporate commissions, merchandise development, the works. This came after 10 years in advertising, and a desire to create more work that made an impact on the world. I hadn’t planned any of this (art life). In Highschool I was trying to deal with being queer. Figuring out what I would be doing with my life was an after thought. If I were told then that in 20 years I’d be painting a 5-story mural on the coast of Africa, that I would accomplish this grand opportunity with my partner/girlfriend, and be the first women to do this in Casablanca, Morocco, I probably would have laughed in disbelief. When I received the call from Neysa, I wanted to shout from the top of my lungs “Yes! I did it! I beat the odds! I proved, hard work pays off!” I wanted to cry, I did cry. Not once did I expect to be in a position where my art would take me to a place that meant I had to return to the closet. I cried on the plane en route to Morocco. As I sat in my seat, leaving Montreal to Casablanca the fact that I would not be able to touch, talk about, or recognize my partner for who she was to me in public for a month, broke my heart. A flood of memories overwhelmed me. All of the hate crimes I’ve survived, two being life threatening, sat with me the most, as I was preparing to enter a place where who I am is illegal. Growing up queer in the states, was challenging, but for the past 15 years it’s been legal to be me. I hadn’t experienced such an unbalanced range of emotions in a while. It was almost like preparing for my first kiss with a girl... “I wasn’t supposed to be doing it”, but the anticipation of that action felt amazing! Jen (my partner) has studied Northern African and Mid-East cultures for over a decade, a professional dancer, she has shared stories of her travels through Morocco many times throughout our relationship, which always piqued my curiosity so, I guess this was destined to be. My tears dried up and I shifted my mind to this life changing adventure presented to me. We wandered the mazes of the Medina in Marrakech. Every step was a joyful reflex as motorcycles piled with two or three people zoomed by, donkeys pulled carts with goods through narrow streets, and pedestrians hustled on to their next destination. I felt my imagination blossom, as my eyes soaked in all of the vibrancy, patterns and details I’d hope to remember for future creations filled my brain. We ate in the homes of the poor and rich, public housing apartments, beautiful restaurants, and glamorous riads, with politicians, every day people, and local artists. We experienced every level of hospitality Casablanca had to offer, and every place presented us with the most exquisite preparation of food I’d ever seen. The elegant dinners included 5 to 6 course meals with moroccan salad, pastilla, cornish hens, fish, and khobz, but they were no match to the couscous that was made for us in the homes of two women. In the neighborhoods where we worked, lived the impoverished, most in need residents. Unsurprisingly, they gave more food and nourishment than we could consume. Countless trays of Moroccan Mint Tea with homemade corn bread, cookies, seloo and Halwa chebakia were delivered to us daily. Some women carried trays of hot tea with several glasses for blocks to treat us to a small break in our days. The smiles that crossed their faces as they handed us a glass, as our spoons filled with couscous, as we gobbled up their creations in gratitude were easily a highlight in this adventure. We could feel the love in their cooking and what more is there to ask for beyond that? There were many encounters which evoked thoughts like “I could have never imagined art would bring me here”. 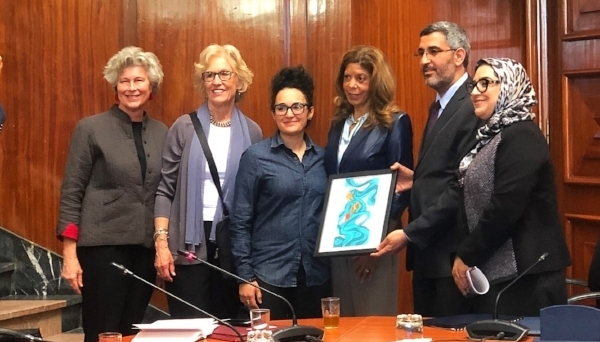 In the beginning, the organization (Chicago Casablanca Sister Cities International) that invited us arranged for several meetings and presented my work to the Mayor of Casablanca, Wali of Casablanca, US Consulate General and her staff. There was so much to celebrate, 35 years of programming between Chicago and Casablanca, and when I looked at who I was surrounded by, who brought me here from Chicago, it was a team of incredibly strong women. All of my work leading up to this point started to replay in my mind. Acknowledging women, celebrating women, being the woman that does the things I’m “not supposed” to do, and here we were, women changing the game again. In the final week of our trip we completed “Sister Cities”, a 5-story mural in the El Hank community of Casablanca that celebrates women, encourages unity and friendship for years to come. During this time, we dealt with the usual external challenges encountered as female muralists, but that couldn’t shake us. We were 40ft in the air on a scissor lift that leaked gas and had other issues with the most incredible view of the Atlantic! We were determined. On multiple occasions despite what nonsense was happening on the ground, we turned around and said “Can you believe this?” We whispered “I love you honey” and exchanged glances of adoration away from windows and places where no one could see or hear us. During this time, I realized another level of love from my partner. Jen chose to cover her head for the month. She often does this in the US as well, but not daily. My appearance when traveling and even in the states is often noticed. The tattoos, hair, androgyny all give pause for thought. While changing some of the answers to many questions and hiding our identities was one task I could manage, I didn’t know how to be anyone else or how to alter my physical self. While I was asked to design this mural, she completed it with me and together we are the first women to complete a mural in Casablanca’s CasaMouja Annual Street Art Festival. I thank the women that brought us here to make this happen. It further cements the steps I’ve taken in my life and I hope more women see this and are encouraged to go beyond what is expected of us, and to support other women in fulfilling their dreams.